It makes perfect sense George Clooney would sign up for the remake of this Norwegian film. It includes two of his favorite activities: scuba diving and blaming America. It is the early 1980s, when Norway is poised to become enormously wealthy thanks to the discovery of oil in the North Sea. Evidently, that is a bad thing. Constructing a pipeline to reach it will be a tricky proposition. 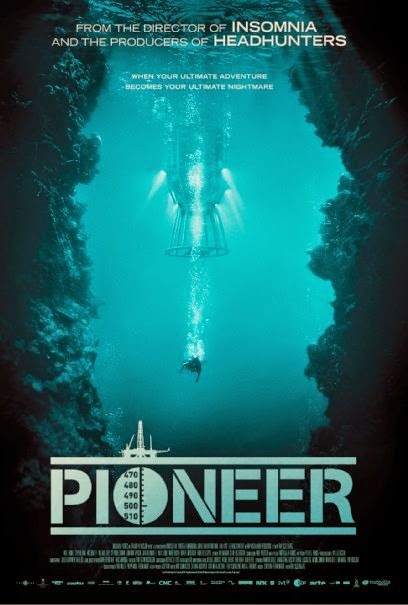 Two advanced deep sea diver brothers are supposed to do the hardest parts, but they will be engulfed by a shadowy conspiracy in Erik Skjoldbjærg’s Pioneer (trailer here), which opens this Friday in New York. 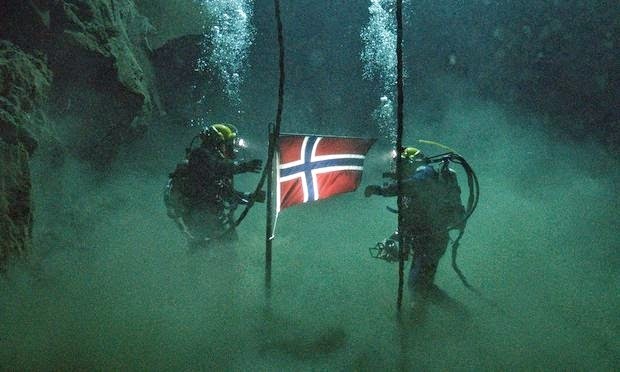 As Pioneer opens, Petter is about to make history for enduring the deepest simulated dive. He will also start hallucinating. Can we ever really trust his perceptions going forward? It is hard to say, because Skjoldbjærg never overtly plays the ambiguous reality-untrustworthy POV cards. Near as we can tell, Petter just shakes off his light-headedness and moves on to the next mission. This time he and his brother Knut will be diving for real. However, since the American engineering firm has assumed operational control, they will now be breathing in the Yanks’ double-secret oxygen tank additive. Of course, the dive goes spectacularly bad, culminating in Knut’s death. Frankly, it kind of-sort of looks like Petter’s fault, but others quite considerately step forward to take the blame. A-ha, it must be the additive. If he can just get a sample to a colleague, he will be able to prove, well he’s not quite sure what, but something really bad. Forget the unreliable narrator, Pioneer gives us an unreliable script. Credited to Skjoldbjærg and a battery of three other screenwriters, it keeps the conspiracy ridiculously murky. Basically, all we can glean with certainty is the Americans will do anything for oil and there is a man with a limp out there up to no good. On the plus side, Pioneer perfectly channels the atmosphere and vibe of paranoid 1970s thrillers, like Parallax View. As Petter (whose entire wardrobe seems to be corduroy), Aksel Hennie looks so Seventies, it is almost tragic. He also projects a quiet mania that really helps the film chug along. Wes Bentley and Stephen Lang chew a bit of scenery as the villainous Americans, but they never elevate their stock characters above the level of predictable cliché. Likewise, Miss Bala’s Stephanie Sigman is largely wasted as Knut’s widow Maria, who simply turns up from time to time to pretend she’s not guilt-tripping Petter when she really is. Ambiguity can be a powerful element in cinema, but viewers should have a sense it is all part of the filmmakers’ deliberate strategy. In the case of Pioneer, it just feels like they lost track of the possible implications of early scenes. Technically, it is an impressive package, especially the work of cinematographer Jallo Faber, who makes early 1980s Norway look so dingy and depressed, it pretty much justifies whatever whoever may or may not have done to hasten the oil boom. The result is an odd curio of a film that simply cannot justify Manhattan ticket prices. It opens this Friday (12/5) in New York at the Cinema Village.